About 120 anglers, sponsors, tackle shops and guests attended the Jersey Shore Beach N Boat Fishing Tournament’s 2014 Official Launch event at the Captain’s Inn in Forked River. About 120 anglers, sponsors, tackle shops and guests attended the Jersey Shore Beach N Boat Fishing Tournament’s 2014 Official Launch event at the Captain’s Inn in Forked River, NJ on Wednesday, May 7, 2014. The weather was a bit damp and cool but that did not chill the spirit of the crowd. Captain’s Inn Tiki Bar, overlooking Forked River was the perfect backdrop for food, entertainment by Dave & Donna and plenty of cheer. Sponsors including the Bud Light handed out samples and trinkets all night and 20 guests left with door prizes. Grace Hanlon, the Executive Director, NJ Division of Travel and Tourism dropped by to visit the businesses and people that support the shore economy. 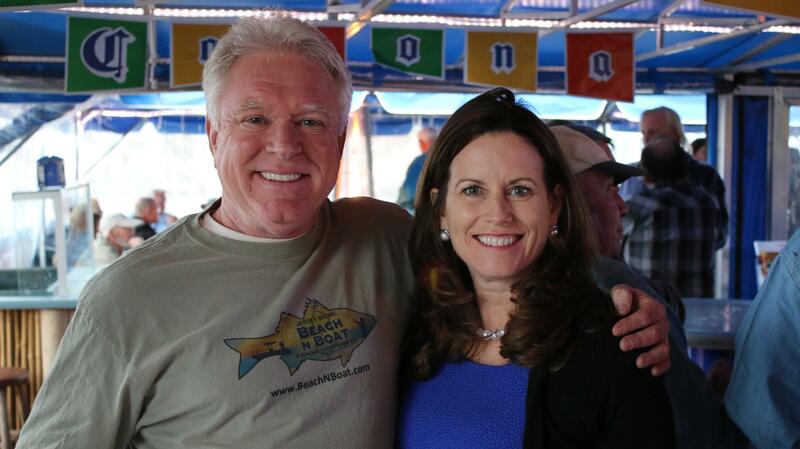 Ms. Hanlon exclaimed, “Beach N Boat is doing an unbelievable job with the statewide annual tournament involving families, businesses and promoting one of New Jersey’s finest assets, fishing.” “You and your team are doing a fantastic job and bringing it all together,” she told Captain Mike Young. 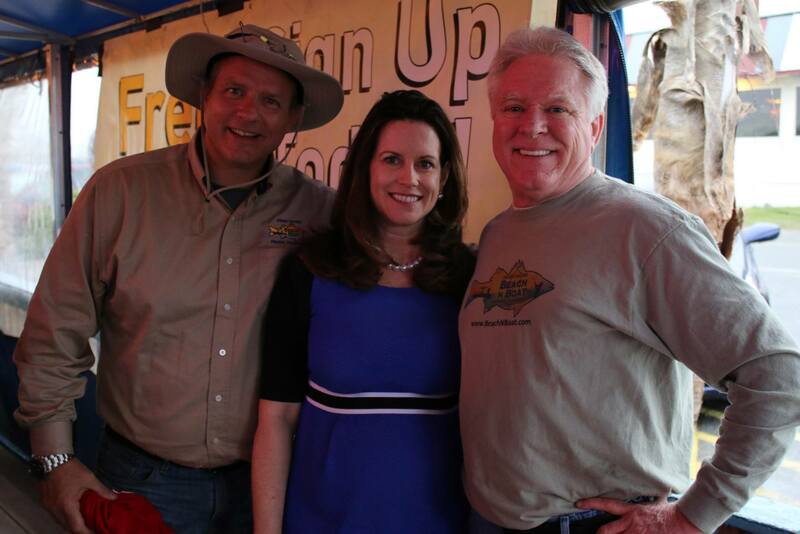 Other special guests included Walt Johnson, First VP of Marine Trades Association – NJ, writer Al Ristori, Jim Donofrio, Executive Director of the Recreational Fishing Alliance and Chris Lido, editor of The Fisherman. Captain Mike says, “How can you go wrong when you have supporters like we have.” In addition to the energetic and enthusiastic anglers, sponsors in attendance included Fairfield Inn & Suites, Millville/Vineland, Goldsmith & Associates, Interlux, MarineMax, Prime Lending, Recreational Fishing Alliance, rhCustom Rods, The Fisherman magazine and Wahoo Internet Marketing. The event is not the only thing that’s hot for Beach N Boat, the leaderboard is heating up. Scott Clarke from Oceanview moved into first place Striped Bass with a 35.13 beauty weighed at 24-7 Bait & Tackle – EHT followed by the number two ranked 24.5 pounder caught by Union, NJ’s Christopher Hernandez who brought it to Capt’n Hippo. Phil LaGrossa, Toms River and Paul Haertel, Clifton, NJ are as close as the weigh stations where they checked-in their fish, Lacey Marine and Creekside Outfitters with 6.8 and 5.86 pound Weakies, respectively. Tor Larson, home port Beach Haven, moved into third place Tog two days before the first season closed weighing in a 9.06 at Jingles Bait & Tackle. The Jersey Shore Beach N Boat Fishing Tournament is a New Jersey statewide, season-long, inshore, saltwater fishing tournament that challenges fishermen, fisherwomen and fisherkids to compete for over $100,000 in cash and prizes between the Annual Tournament and Challenges. Participants can fish in saltwater from anywhere; beach, boat, jetty, canoe once or everyday for Stripers, Fluke, Weakfish, Black Drum, Bluefish, Kingfish, Tog and Sea Bass. Unlimited weigh-ins at over 50 convenient weigh stations. Sign up for FREE with Code 2701 at www.BeachNBoat.com. Supported in part by a grant from the New Jersey Department of State, Division of Travel and Tourism.